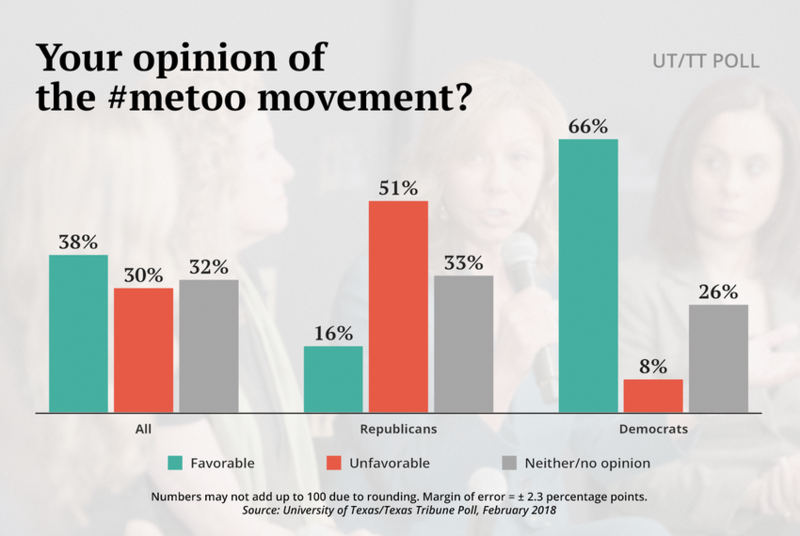 A majority of Texas Republican voters have unfavorable views of the #metoo movement, while most Democrats view it favorably, according to the latest University of Texas/Texas Tribune Poll. The #metoo movement is getting a mixed reaction in Texas, but a majority of the state’s voters believe increased attention to sexual assault and harassment is going to improve the lives of most women, according to the latest University of Texas/Texas Tribune Poll. Overall, 38 percent of Texans said they have a favorable view of #metoo — including 21 percent who said their opinion is “very favorable” — while 30 percent have an unfavorable opinion. That group includes 15 percent who said they have a “very unfavorable” opinion of the movement. Democrats are much more likely than Republicans to have a favorable opinion of the #metoo movement. Two-thirds of Democrats have a favorable opinion, compared with 16 percent of Republicans. A majority of Republicans have unfavorable views of #metoo, an opinion shared by only 8 percent of Democrats. “This movement, like several other movements, is amazing in how fast it became polarized along party lines,” said Daron Shaw, a government professor at the University of Texas at Austin and co-director of the poll. Women (41 percent) are more likely than men (35 percent) to view the movement favorably. But the partisan gap is wider than the gender gap. While 65 percent of Democratic women have a favorable impression of #metoo, only 17 percent of Republican women do. Most Texas voters believe recently increased attention on sexual assault and harassment is helping to address gender inequality in the United States, and more than half believe that attention will improve the lives of most women. They have some reservations, however: 44 percent agree that the recent attention is leading to the unfair treatment of men, while 47 percent disagree. Men were more likely than women to agree, and Republicans were more likely than Democrats to agree. Some of the responses about the issue itself — whether women will benefit from the debate, for instance, blur the partisan lines that appeared on the question about #metoo. Three-quarters of Texas voters believe Muslims and transgender people suffer from “a lot” or “some” discrimination. Two-thirds or more say the same about African-Americans, gays and lesbians, Hispanics and women. Fifty percent of Texans say Christians suffer from discrimination, 47 agree that Asians do, 39 percent say whites are discriminated against and 31 say men are discriminated against. When that question is changed a bit — to which of all of those groups “faces the most discrimination in the United States today” — the list is topped by African-Americans (21 percent), Muslims (19 percent), Christians (15 percent) and transgender people (13 percent.) The rest, in order, got 10 percent or less: Whites, Hispanics, Men, Women and Asians.